Pioneers in the industry, we offer high temperature oven, powder curing oven, paint curing oven, hot air oven, gas fired ovens and electric hot air oven from India. We are manufacturing and supplying a wide range of High Temperature Oven in finest quality of raw material sourced from the trusted and reliable vendors of the industry, these products are non-corrosive and long lasting. Our ovens are energy saving and cost effective and hence ensure profitability in competitive market.Optimum air flow design High density insulation Variety of heating media and Diesel fired burner's are High efficiency to complete combustion Automatic temperature controls unique design of heat exchanger for improved heat transfer efficiency. This is generally done by having a heating chamber where air is heated and the heated air is circulated inside the Paint Baking Oven chambers by means of fans. 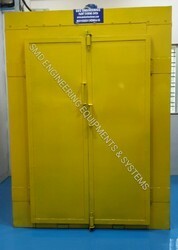 With the assistance of our deft team of professionals, we are able to introduce a broad array of Powder Curing Oven. At our manufacturing unit, the offered oven is designed in a way so that it consumes low power while maintaining a uniform temperature in the working space. 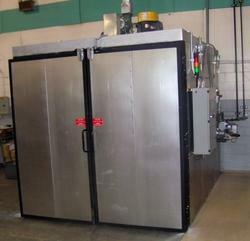 This oven is specially built and designed for powder curing and liquid curing purposes. The powder is firstly melted at a required degree of temperature for a certain time. The product is then flown out, chemically reacting so that it is completely cured and ready to use for which it has been designed. 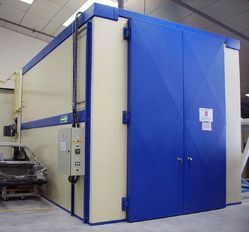 Paint Curing Oven offered comes designed and developed using latest technology support and provides for stable working support. 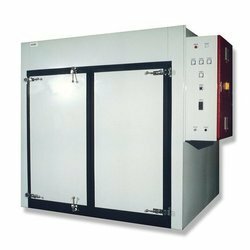 We manufacture standard and customized HotAir Oven with Diesel Fired Burner .The oven uses dry heat to sterilize articles. Generally, they can be operated from 50 to 300 °C. There is a thermostat controlling the temperature. These are digitally controlled to maintain the temperature. Our ovens are energy saving and cost effective and hence ensure profitability in competitive market. Optimum in air flow design High density insulation Variety of heating media. Unique design of heat exchanger for improved heat transfer efficiency. We offer Electric Hot Air Oven. These are precision designed and developed as per emerging requirements of customers and market needs. Further, these electrical dryer are made available in different features like use of Ceramic type Heater, Digital temperature Controller with automatic temperature cut off and 3 Part ON/OFF System so as to ensure optimum functionality standards. Further, the low power consumption ad presence of complete insulated body.Also makes these electrical dryers deliver optimum functionality standards. 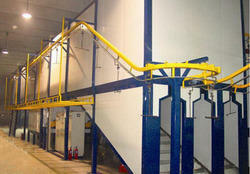 We Offer’s Paint Drying Oven to removes the moisture from water-based coatings and adhesives. Paint Drying Ovens are also removes water from the surface or interior of products with the help of thermostatic controls in case of electrical heating and temperature controllers operating solenoid valves in case of steam, gas and oil heating. 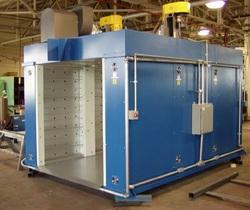 A Paint Drying Oven dries the paint through the heated air that is re circulated in the Oven. This is generally done by having a heating chamber where air is heated and the heated air is circulated inside the Paint Drying Oven chambers by means of fans. We Manufacture Industrial Batch Oven Which can be used for preheating, drying, and curing. Preheat ovens prepare various metals, plastics, wood, medium density fiberboard or other substrates for your coating or adhesive process. Drying ovens help eliminate water or moisture accumulated during the pre-treatment washing process. 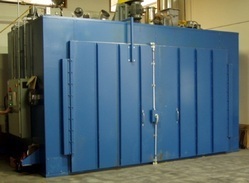 Batch Ovens help to elevate the part and coating temperature to achieve the desired coating cure characteristics. We offer Batch Ovens with complete assembly package of a burner box and manifold, an oven enclosure, door(s), an electrical control panel, and a powered exhaust fan. Installation, Start-up and operating instructions are included. We Manufacture Heating Oven. This dries the painted or Powder coated component through the heated air that is re circulated in the Oven. This is generally done by having a heating chamber where air is heated and the heated air is circulated inside the Oven chambers by means of fans. 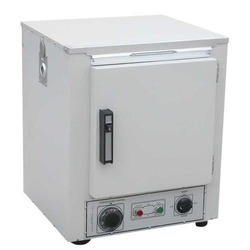 Heating Oven which designed in such a way so as to consume low power with a uniform temperature in the working space provided in the Oven Chamber. 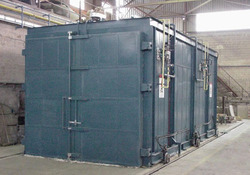 Our Heating Oven are specially built and designed for Paint, Powder Curing and Liquid Curing purposes flexible. 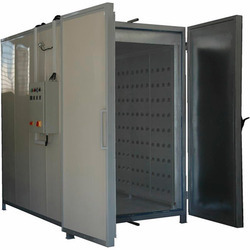 We Offer’s Industrial Drying Oven are used across a range of industries and research laboratories for simple applications, such as drying and sterilizing glassware, to complex processes that require controlled heating and temperature uniformity such as bonding and curing. 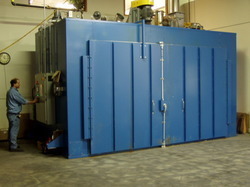 Industrial Drying ovens generally operate from ambient heat to 50°C to 300°C. Drying ovens may be designed for batch processing or with a conveyor for continuous processing. Dispatch Industries builds high performance drying ovens of multiple sizes, processing requirements and temperature capabilities to meet and exceed clients’ laboratory and production applications. Backed by rich industry experience, we are manufacturing, supplying and trading Dry Off Oven. The professionals hired by us make sure that no compromise is made with quality in the manufacturing process. Post-production, we thoroughly inspect these lifts on certain well-defined parameters of quality in order to rule out every possibility of defect. Backed by rich industry experience, we are manufacturing, supplying and trading Industrial Dry Off Oven. The professionals hired by us make sure that no compromise is made with quality in the manufacturing process. Post-production, we thoroughly inspect these lifts on certain well-defined parameters of quality in order to rule out every possibility of defect. We manufacture Conveyorised Hot Air Oven with straight tunnel, camelbak, a-zone type ovens for conveyorised lines for continuous production lines. 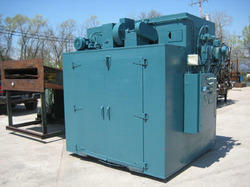 Adequately sized hot air generators are provided with suitable heating medium such as diesel, gas, or electrical. Uniform heat distribution is ensured by hot air blowers and specially designed ducting system. We provide our unique design hot air seal at the ends of the oven to prevent heat losses. Paint Baking Ovens, also referred to as Dryers or Paint Curing Ovens or removes the moisture from water-based coatings and adhesives. 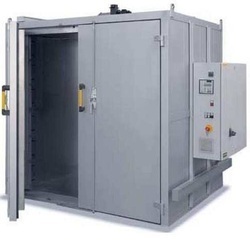 Paint baking Ovens are also removes water from the surface or interior of products with the help of thermostatic controls in case of electrical heating and temperature controllers operating solenoid valves in case of steam, gas and oil heating. A Paint Baking Oven dries the paint through the heated air that is re circulated in the Oven. This is generally done by having a heating chamber where air is heated and the heated air is circulated inside the Paint Baking Oven chambers by means of fans.